Lunæ, 7 die Aprilis, 1679. Back-door of Speaker's Chamber, &c.
Message from the King. Information from a Prisoner. Impeachment of Earl of Powys, &c.
Lords Amendments to Earl Danby's Attainder Bill. ORDERED, That all Committees be revived; and do sit this Afternoon, in the Places formerly appointed. Ordered, That the said Richard Blyth be sent for in Custody of the Serjeant at Arms attending this House, to answer the said Breach of Privilege at the Bar of this House. Ordered, That the Back-door belonging to the Speaker's Chamber be locked up; and that the Keys do lie upon the Table, whilst the House is sitting: And that the Window next adjoining to the said Door be shut up. Ordered, That a Committee be appointed to examine the Matter of the Complaint against Sir John Robinson, a Member of this House, touching the Lords and other Prisoners in the Tower, and other his Miscarriages; and report the same to the House. And it is referred to Sir Gilbert Gerrad, Sir Athony Irby, Sir Richard Corbet, Sir Francis Drake, Mr. Garraway, Sir Trevor Williams, Sir John Talbot, Sir Christopher Musgrave, Sir Wm. Franklyn, Sir Robert Cleyton, Sir Robert Peyton, Sir Henry Ford, Mr. Trenchard, Colonel Birch, Sir Wm. Coventry, Mr. Reynall, Mr. Sachaverell, Sir Thomas Lee, Sir Nic. Carew, Mr. Duboys, Sir Tho. Player, Sir Philip Skippon, Sir John Guyes, Sir John Trevor, Sir Wm. Roberts, * Thomson,* Browne, Mr. Foley, Sir Edward Harley, Mr. Booth, Sir Joseph Tredenham, Mr. Powle, Sir John Mallet, Mr. Hamden, Sir Robert Markham, Mr. Papillon, Mr. Pilkington, Sir Philip Egerton, Sir Rice Rudd, Mr. Barker, Sir George Hungerford: And they are to meet this Afternoon, in the Speaker's Chamber: And are impowered to send for Persons, Papers, and Records. Mr. Secretary Coventry acquaints the House, That Mr. Cheffinch had received a Letter from Mr. Redding, intimating, That he had Matters of great Importance concerning the Prisoners in the Tower, and the present Plot; which he desired might first be communicated to his Majesty, or One of his Principal Secretaries: And his Majesty, having been made acquainted with the Contents of the said Letter, did declare, That he would not intermeddle with any Prisoner committed by this House: And that his Majesty would (if the House thought fit) not only permit him, but lay his Commands on him, that whatsoever he knew of that Affair, or intended to have communicated to his Majesty, or his Secretaries, he should frankly and freely impart the same to the House of Commons, or the Committee of Secrecy by them appointed. Resolved, &c. That the humble Thanks of this House be returned to his Majesty, for his gracious Message this Day sent to this House by Mr. Secretary Coventry: And that his Majesty be humbly desired to lay his Commands upon Mr. Reading, to impart to this House, or the Committee of Secrecy by this House appointed, what he knows or intended to have communicated to his Majesty, or his Secretaries, concerning the Prisoners in the Tower, or the present Plot. Ordered, That Mr. Secretary Coventry do present to his Majesty the humble Thanks of this House. Ordered, That the further Examination of Mr. Redding be referred to the Committee of Secrecy: And that Mr. Secretary Coventry do communicate to Mr. Redding his Majesty's Pleasure, in Answer to his Letter sent to Mr. Cheffinch. 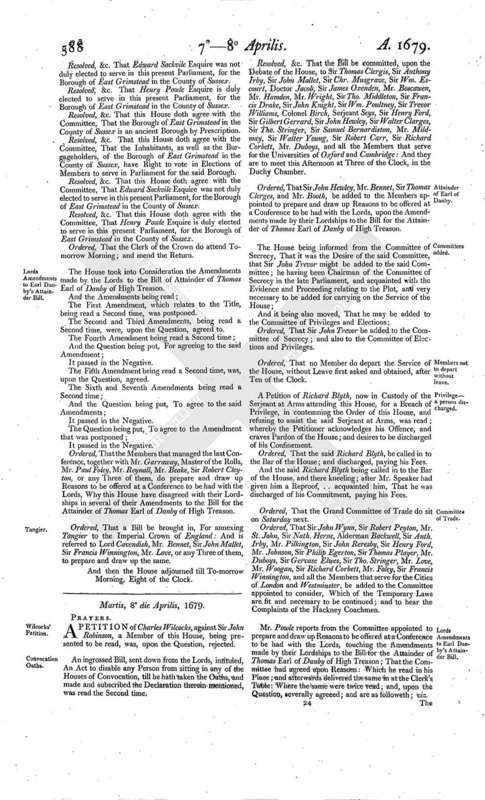 The Articles of Impeachment of High Treason, and other High Crimes and Offences, against William Earl of Powys, William Viscount Stafford, Henry Lord Arundell of Wardour, William Lord Petre, and John Lord Bellasis, now Prisoners in the Tower, were read. Ordered, That the Lord Russel do carry up the said Articles of Impeachment to the Lords. Ordered, That the Committee, appointed to inspect and state the Accompts relating to the Army, do make their Report on Wednesday Morning next, at Ten of the Clock. Resolved, &c. That on Thursday Morning next, at Ten of the Clock, the House will resolve itself into a Committee of the whole House, to consider how to improve the Militia for the Safety of the King and Kingdom. Sir Thomas Meers reports from the Committee of Elections and Privileges, that the Committee had taken into Consideration the Matter of the Election for the Borough of East Grimstead; and had agreed upon a Report to be made to the House: Which he read in his Place; and afterwards delivered the same in at the Clerk's Table: Where the same was twice read; and upon the Question, severally agreed to; and is as followeth; viz. The Question was, Whether the Inhabitants at large, or the Burgageholders alone, had the Right of Election of Members to Parliament, for the Borough of East Grimstead. The Inhabitants the Petitioners produced the several Records following, to prove East Grimstead a Borough by Prescription; and that all the Inhabitants have Right to vote in Elections, viz. 21. Jacobi. -The Bailiff, Burgesses, and Inhabitants, of their common Assent, jointly together, have chosen-. They offered several other Records to prove the same; But the Counsel of the other Side admitted, they were to the same purpose. Then the several Witnesses following were examined; viz. Mr. Robert Goodwyn says, He has known this Borough above Sixty Years, and served in Parliament for the same in the 18 Jacobi, and in several Parliaments afterwards; and, in all his Elections, the Inhabitants as well as the Burgageholders chose him, and voted in all Elections from the Eighteenth King James till his Majesty's Restauration, when he gave over standing by reason of his Old-age: And says, He searched the Records; and found by Five of them, that the Inhabitants had Right to vote in Elections; and therefore he took them in all his Elections. Thomas Cocket says, He was an Inhabitant, and no Burgageholder; and yet voted in an Election, Forty Years ago, for Mr.Goodwyn. Robert Mathews, and another, say, They were present at the Election for East Grimstead, in February last; and, after the Precept was read by the Bailiff, about Sixty of the Inhabitants demanded the Poll for Mr. Powle: But the Bailiff denied them; and thereupon they voted for Mr. Powle, and elected him, and signed and sealed an Indenture, whereby he is returned One of the Burgesses. They say, That Mr. Powle had about Sixty Voices, but no other Competitor had above Eighteen. The Inhabitants offered other Evidence: But the Counsel of all Sides agreed, That the Inhabitants at large have Right to elect; and that Mr. Powle was well elected. Then the Counsel for Mr. Scroggs pretended to prove their Client elected in the next Place: But he, in his Petition, only asserting himself well elected, and not denying the Election of Mr. Pelham, Mr. Scroggs' Counsel, and all other the Counsel and Witnesses, were made to withdraw. The Counsel for the Inhabitants did not oppose Mr. Pelham. After Debate; the Committee came to these Resolves. Resolved, &c. That the Borough of East Grimstead in the County of Sussex is an ancient Borough by Prescription. 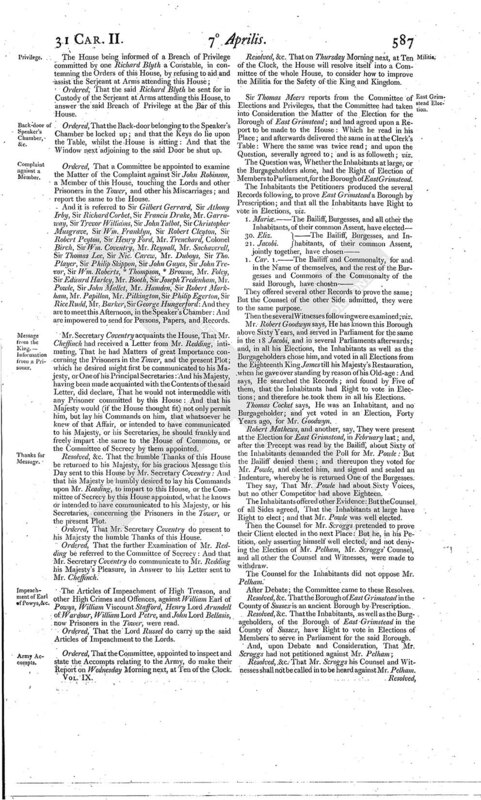 Resolved, &c. That the Inhabitants, as well as the Burgageholders, of the Borough of East Grimstead in the County of Sussex, have Right to vote in Elections of Members to serve in Parliament for the said Borough. Resolved, &c. That Mr. Scroggs his Counsel and Witnesses shall not be called in to be heard against Mr. Pelham. Resolved, &c. That Edward Sackvile Esquire was not duly elected to serve in this present Parliament, for the Borough of East Grimstead in the County of Sussex. Resolved, &c. That Henry Powle Esquire is duly elected to serve in this present Parliament, for the Borough of East Grimstead in the County of Sussex. Resolved, &c. That this House doth agree with the Committee, That the Borough of East Grimstead in the County of Sussex is an ancient Borough by Prescription. Resolved, &c. That this House doth agree with the Committee, That the Inhabitants, as well as the Burgageholders, of the Borough of East Grimstead in the County of Sussex, have Right to vote in Elections of Members to serve in Parliament for the said Borough. Resolved, &c. That this House doth agree with the Committee, That Edward Sackvile Esquire was not duly elected to serve in this present Parliament, for the Borough of East Grimstead in the County of Sussex. Resolved, &c. That this House doth agree with the Committee, That Henry Powle Esquire is duly elected to serve in this present Parliament, for the Borough of East Grimstead in the County of Sussex. Ordered, That the Clerk of the Crown do attend Tomorrow Morning; and mend the Return. The House took into Consideration the Amendments made by the Lords to the Bill of Attainder of Thomas Earl of Danby of High Treason. The First Amendment, which relates to the Title, being read a Second time, was postponed. The Second and Third Amendments, being read a Second time, were, upon the Question, agreed to. The Fifth Amendment being read a Second time, was, upon the Question, agreed. 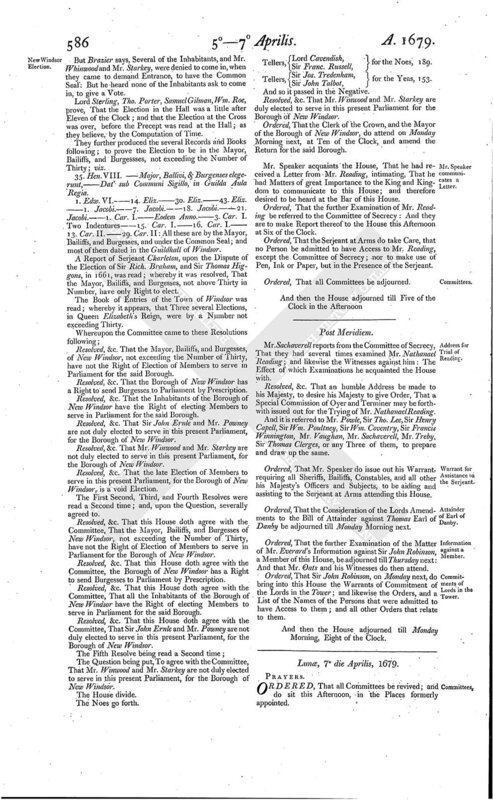 Ordered, That the Members that managed the last Conference, together with Mr. Garraway, Master of the Rolls, Mr. Paul Foley, Mr. Reynall, Mr. Beake, Sir Robert Cleyton, or any Three of them, do prepare and draw up Reasons to be offered at a Conference to be had with the Lords, Why this House have disagreed with their Lordships in several of their Amendments to the Bill for the Attainder of Thomas Earl of Danby of High Treason. Ordered, That a Bill be brought in, For annexing Tangier to the Imperial Crown of England: And is referred to Lord Cavendish, Mr. Bennet, Sir John Mallet, Sir Francis Winnington, Mr. Love, or any Three of them, to prepare and draw up the same.